Introducing the JHM Performance Carbon Synchros!!! 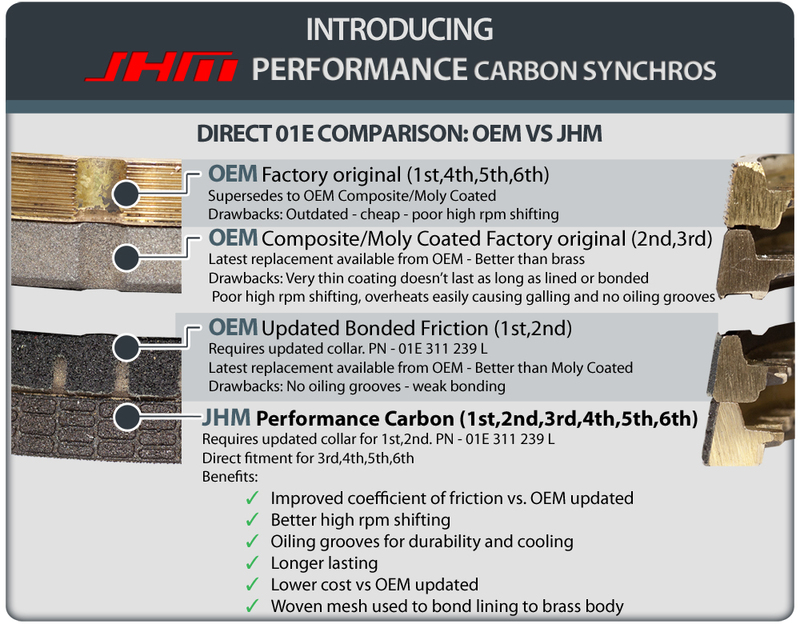 We now offer our 01A JHM Performance Carbon Synchros separately from our Full Rebuild kit for a MUCH lower price than OEM synchros while providing better performance. NOTE: Comparison is done on an 01E transmission. They share the same synchros for all gears except 1st and 2nd with the 01A 5-speed. The 01A only had the brass and Composite/Moly Coated synchros, there are NO updated 1-2 synchros like for the 01E. You cannot use the JHM 1-2 01E synchros on an 01A due to a different engagement angle. We only make synchros for 3-4-5-R on the 01A 5-speed. We've been long term testing these JHM Performance Synchros on several cars for thousands of miles. We even took the JHM B5-S4 to Las Vegas to Wuste 2012 with the synchros installed. INCLUDES THE FOLLOWING Transmission Rebuild Video on DVD (1 hour 47 minutes in length) NOTE: Video was done on an O1E 6-speed (different, but very very helpful info) and in combination with a Bentley Manual the rebuild should go smoothly - OEM synchronizer rings for gears 1-2 (2) - JHM Performance synchronizer rings for gears 3-4-5 and Reverse (4) - OEM synchronizer springs (6) - OEM input shaft seal - OEM rear lower shaft rubber - OEM Upper rear case seal - Rear Case lower o-ring - OEM front output shaft seals (2) - OEM selector shaft seal. 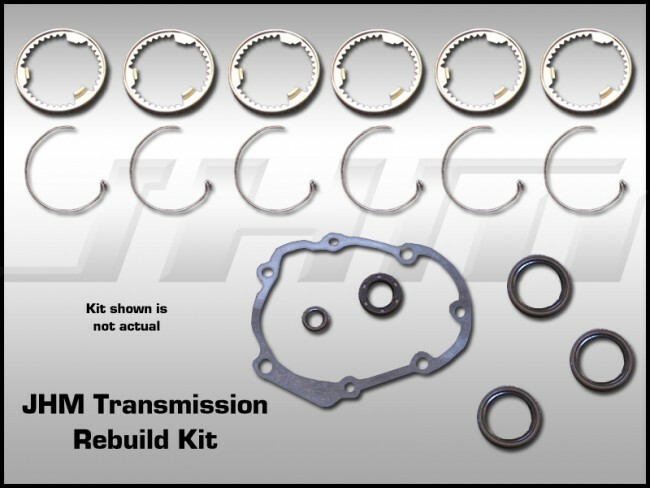 OPTIONS: If you do not need the complete kit or need just the parts to make a repair please email sales@jhmotorsports.com for pricing. We do not offer them separate without talking to our customers. We want to speak with you and make sure you get exactly what you need. Hard part options: If you need something not listed below, please email us for a price quote (new and used hard parts available). NOTE: Kits usually ship out from our location within 1 to 4 days depending on our current stock.